Working from height is a well-documented risk in the construction industry. Falls from ladders/roofs and falls on the same level are commonly reported accidents in New Zealand, and some had led to fatal injuries. In 2010, a roofer died after falling two floors through the skylight of the building he was working on. In 2013, a construction worker suffered from a broken pelvis and facial injuries after a five-metre fall, leading to the construction company paying over $60,000 in fines. And just last year, another firm was convicted and fined for exposing workers to the risk of fall, after one of them plummeted 2.8 metres from a roof without edge protection. The firm was found guilty of violation under section 36(1)(a) of the Health and Safety at Work Act 2015 (HSWA). According to WorkSafe’s General Manager of Operations and Specialist Services Brett Murray, fall injuries are more common on residential building sites than other workplaces in the construction industry. 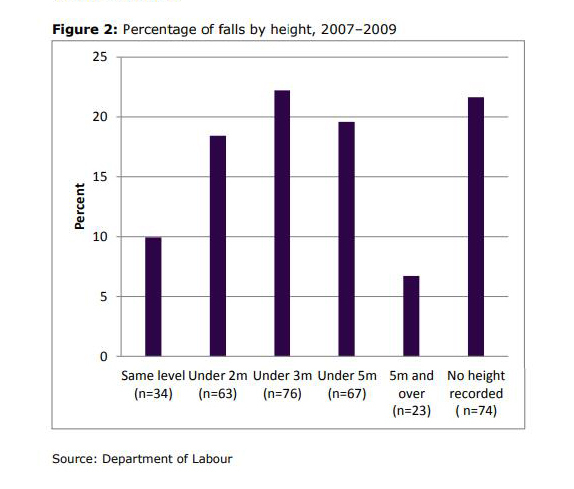 The Ministry of Business, Innovation and Employment has found that 70 percent of falls are from temporary structures of less than three metres in height, while 50 percent of falls are from permanent structures. A fall arrest system such as a safety net is a good solution for this. A safety net acts as a physical barrier between the workers and the ground below so a worker is less likely to be harmed in the event of a fall. How exactly do safety nets work? Safety nets are designed to absorb the impact of a fall. They are suspended directly below the platform from where a worker on site may fall. They are engineered to stretch in a controlled way to minimise the height and consequences of a fall, providing a soft landing for the faller and minimising injury. Since they provide passive protection, individuals working at a height do not have to do anything personally to be safe. This allows workers to do their job without restricting their movement. In other words, having a safety net installed facilitates workers’ productivity and provides a safe work environment at the same time. By ensuring that all practicable steps are taken to eliminate hazards where possible, employers can help prevent fall accidents within the workplace. Safety nets are not mandatory in Auckland, but it’s high time this changed. Netting can easily save a life. That is, of course, if the safety net is reliable and high quality. Sitenets Ltd has a range of safety net solutions for construction and commercial worksites. Our nets meet all NZ safety standards and are known nationwide for their strength and dependability. Check out our comprehensive range or call 0800 378 921 for inquiries. 2018 is well underway and it’s as important as ever to keep safe on the job, especially when working at heights. It’s vital to be aware of all legislation and laws both from a legal perspective and from a personal safety perspective, to ensure everyone is safe on the job. So what are some things to remember when working at heights? Falls from 2 meters or above are considered serious and can cause serious harm or death. If anyone is working at these heights, it is vital to consult with an expert about the best options from fall prevention. All hazards, risks and the safety of the individuals doing the work must be taken into account before advising a safety solution. Everyone involved must feel and be safe, so any expressed concerns need to be addressed before any work commences. Fall arrest systems are required by law when working is being carried out at height, and must be installed correctly in order to provide the protection required. This is where installation quality comes into play. An improperly installed safety netting system is as good as not installed, so it is vital to ensure that the installers are experienced and qualified. We at Sitenets Ltd are here provide the solutions you need to heights safety. We offer all safety net fall arrest protection solutions to ensure that everyone on your job is a safe as possible. If you are starting a job that will involve working at heights, consult with us on which is the best course to take with regards to safety netting and height safety, and we will ensure that you have a safe working environment! As 2018 kicks off, even more building in going on in New Zealand, specifically in areas like Auckland and Christchurch where construction projects are at an all time high. And among all these, safety is a paramount focus to keep things going safely and smoothly. All of these can be prevented with the proper preparation, patience and vigilance. And we at Sitenets Ltd are here to ensure we do everything we can to help you keep safe. When it comes to fall prevention and height safety systems, we are your one stop shop. 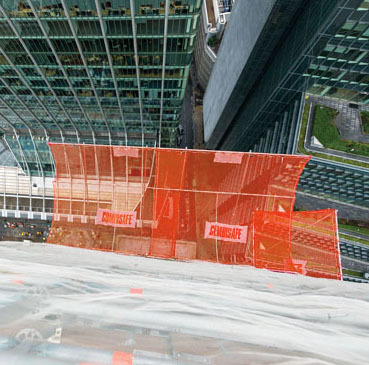 Our fall protection safety nets will ensure that you are kept safe at all times, whether you are working at heights or are at risk of falling objects. Our nets are used nationwide to prevent falls, falling debris and other height related hazards from occurring. If you have a construction project you are managing and will need safety nets, be sure to contact us on 0800 378 921 today! Christchurch has had a big project on recently, the new Central City library, dubbed “Tūranga”. Tūranga will be a cultural hub for Christchurch and an important civic space that attracts people back into the central city. It is due to open in 2018.
be a place for people to go to read, learn, study, swap ideas, do research, try new technology and socialise. offer easy access to lending and reference material, digital resources, and local, heritage and special collections. provide a wide range of programmes, events, exhibitions and experiences for all people of all ages and backgrounds. support the wider Christchurch library network which includes 19 community, mobile and digital libraries. 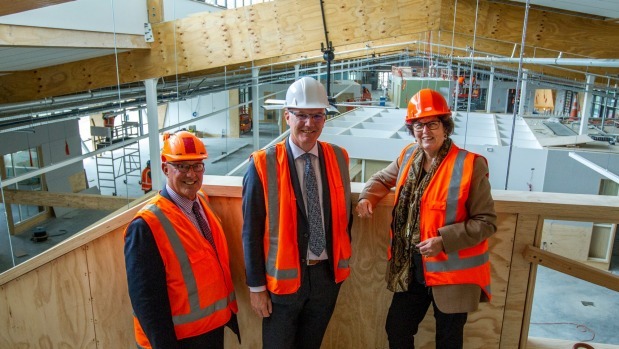 Being 9,850m2 in size, it will be the largest public library in the South Island and about a third larger than the old Library. The Council’s total budgeted cost for the building and land is $92.7 million. It is a key anchor project and part of the Christchurch Rebuild Program. We at Sitenets Ltd were right in the middle of this project, taking care of the safety net install throughout the build. A project of this size requires careful attention to ensure that all areas are covered when it comes to safety. Spanning several floors and many square meters, a lot of netting is involved in a project like this. Commercial settings provide a whole new range of challenges to the safety netting job. With the added complexity comes the need to be able to cover a wide range of circumstances and requirements when it comes to commercial safety nets. This can be far more complex than what you would find at a residential construction site. Because of this, special equipment may be required to install the nets. Along with that, more durable nets are generally recommended on commercial sites so that they can withstand more abuse then in a residential setting. We at Sitenets Ltd specialise in commercial safety netting systems. 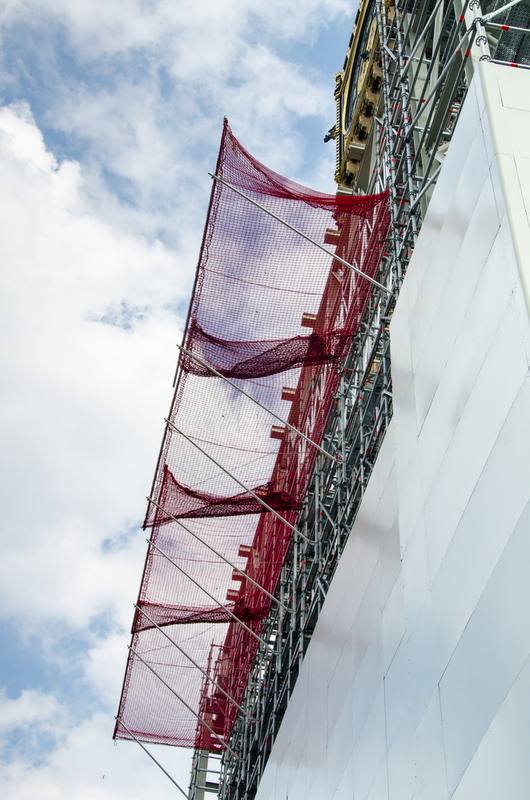 If you are partaking in a commercial building project, get in contact with us today to organise safety netting. We will review your project and recommend to you the best solution for your commercial project. Scaffolding is a very commonly used in construction and building. On any project that extends past groundwork, you are sure to see scaffolding of some sort used to allow workers to get to higher levels. So firstly, what exactly is scaffolding and how does it work? Scaffolding is a temporary framing structure used to create a platform for workers to use to access higher levels on buildings or other high objects. The type of scaffolding will depend on the type of work being done and where it is located. It is most commonly made of steel. Single Scaffold – This is generally used for brink masonry and sometimes is referred to as Brick Layer’s Scaffolding. It consists of standards, ledgers and putlogs which sits parallel to the wall at 1.2m. Distance between the standards is 2 – 2.5m. The ledgers connect the standards at intervals of 1.2 – 1.5m vertically. The putlogs are placed at intervals of 1.2 – 1.5m apart. Double Scaffolding – Generally used for stone masonry, it is also called Mason’s Scaffolding. Because it is hard to make holes in stone walls to support the putlogs, two rows of scaffolding is constructed to make it stronger. The first row is placed 20 – 30cm away from the wall and the other 1m away from the first row. The putlogs are placed to support both frames. To increase strength, rakers and crossbraces are used. Cantilever Scaffolding – This scaffolding works whereby the standards are supported by a series of needles and these needles are taken out through holes in the wall. It can also be called single frame type scaffolding. With other types, the needles are strutted inside the floors through the openings, this being called Double Frame or Independent type scaffolding. 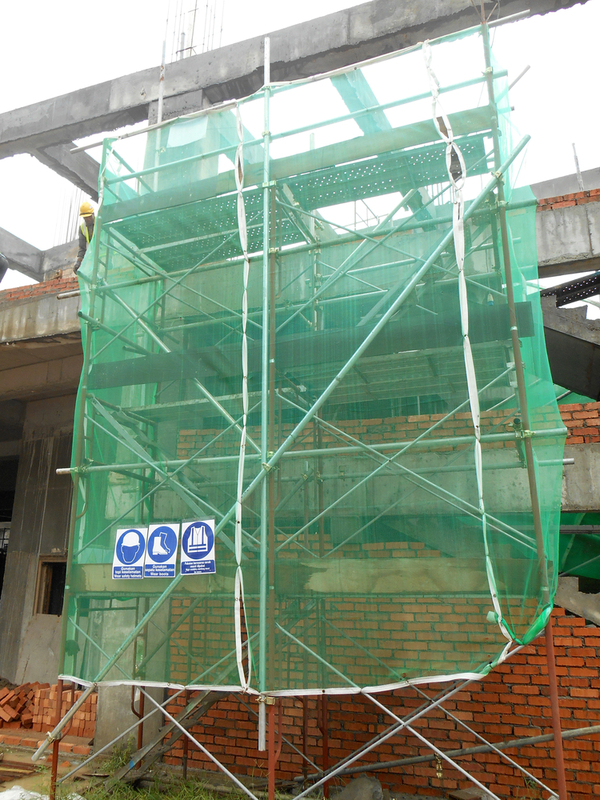 This type of scaffolding is used when the ground does not have the capacity to support the standards, when the ground near the wall needs to be free from traffic and when the upper part of the wall is under construction. Suspended Scaffolding – Mostly used for repair works, pointing, painting etc, with this scaffolding the working platform is suspended from the roof with the use of wire ropes or chains. It can be raised or lowered to the required level. Steel Scaffolding – The most common type of scaffolding used today. It is constructed by steel tubes which are fixed together by steel couplers. It’s very easy to put together and dismantle, has greater strength, durability and fire resistance than the other types of scaffold. So how does scaffolding relate to safety nets? Safety nets play a big part in preventing both people and objects falling off scaffolding. When using scaffolding past a certain height, you are required to use safety nets to ensure the safety of both workers and people around and to prevent falls. Are you putting up scaffolding and need safety nets? 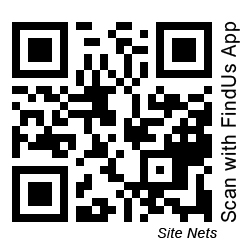 Get in contact with us now to arrange fall prevention nets for any scaffolding. Why Are Safety Nets Considered Security Nets? Safety nets are often installed on building sites with the view that they are there to protect the workers should they fall from scaffolding or high up on the site. This is true and is a vital part of safety nets performance, however, they also have a secondary but just as vital service to provide – one of security. How? Well, what if you happened to be walking under an area where building was happening above you and something was dropped? Having a safety net installed would provide you with the security of knowing that you were protected. “Security” is often a word that is described as being the state of being free from danger or threat. Isn’t that what you want your work team to feel when they are on one of your building sites. WorkSafe NZ’s current push is to remind employers to get their teams home healthy and safe. Installing a safety net at your building site will help to ensure just that. Your people are worth the investment. Having a security net installed between the upper reaches of your building site allows you to have teams working on multiple levels of your site and all workers have both safety and security provided for them. Safety nets are designed to reduce the likelihood of a person who has fallen being injured. They are installed with a specific tension designed to deflect and absorb the energy of an object or person that falls. When you have a building site that is more than a storey high, a safety net will also reduce the distance a person can fall. If a person was to fall, a safety net is always positioned so that there is enough clear space below the net and the ground so that the fallen person or object does not strike an obstacle or the ground. Some people worry that a safety net will restrict their ability to move around the site. This is not the case. Safety nets can be installed across scaffolding to provide a sense of “walls” no matter how high up the scaffolding is. Safety net installers are well aware of the type of movement that needs to be allowed for construction workers at height and thus will install the safety nets with enough tension to allow movement but with enough tautness to stop anything or anyone from falling. provision and maintenance of sanitary facilities for staff. Workplace health and safety is taken very seriously in New Zealand and there are hefty fines and penalties for companies found in breach of standards. provide your staff with safety AND security and install a Site Net safety net system! Canterbury continues to push ahead in rebuilding and future proofing development far away from the 2010 earthquake destruction. With over $36 million committed to Canterbury’s schools and academic facilities, modern new learning environments have taken shape all over the Canterbury horizon. Helping to keep the workers on these sites safe has been Site Nets. Whether it has been an 8 class building or a new school hall or administration block, Site Nets safety nets have been on site protecting workers during their time on the sites. 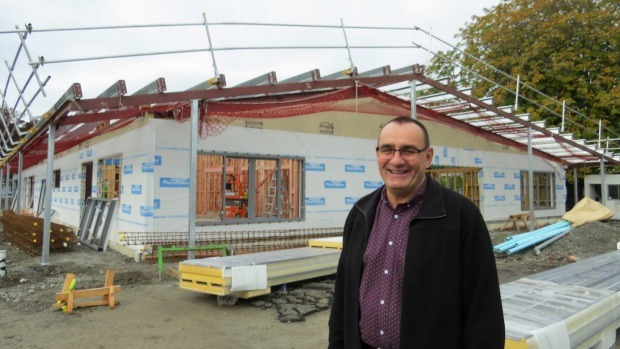 When an area faces an increased building boom, like Canterbury has been forced to undertake due to the unwanted earthquakes, often building supplies and construction equipment can be put under a demand that cannot be satisfied. 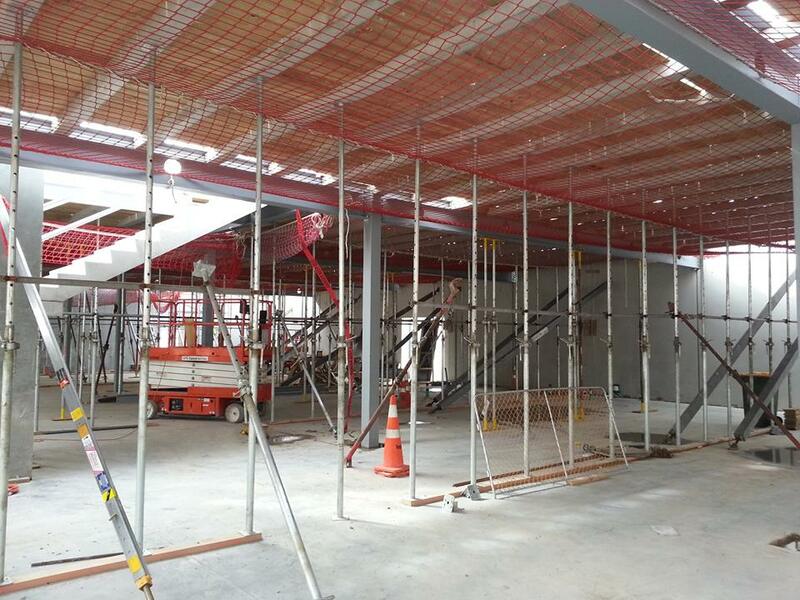 Due to Site Nets 35 years of manufacturing of high quality safety nets, we have been able to provide safety netting for almost all of the Canterbury Ministry of Education school rebuild sites. This is something that we are proud to have been able to support. The safety issues that crop up on building sites can be similar in nature, or highly varied due to the timeframes, the positioning of the site and the number of workers on the site at any one time. Due to these factors, project managers have a high expectation for the safety of their workers. Time after time, Site Nets are the preferred supplier of safety netting for high end construction sites. Our netting is well known in the industry to be of the highest quality and our company is known for our outstanding commitment to constant innovation. 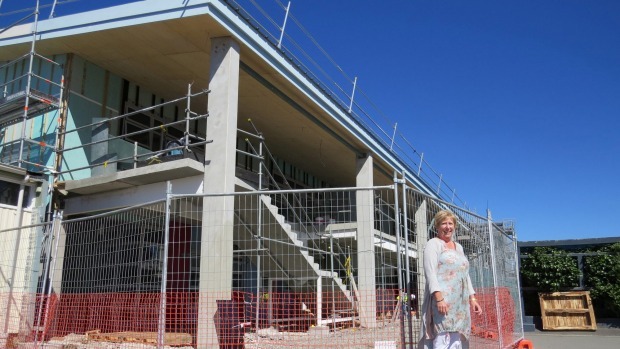 One of the projects that Site Nets are currently supporting is the redevelopment of Kaiapoi High School. The first stage is underway and is expected to be completed by the end of the year. Not only are there stages to the redevelopment but in between stage one and the secondary stage, the old block which will stand between the two new developments will need to be demolished. This too will require Site Nets safety netting to ensure the safety of everyone on site. The health and safety of everyone on a building site is paramount. Without having your workers’ safety covered properly the likelihood of your project coming to completion safely is in question. Not only is it law to have health and safety requirements met on site but it is an insurance and assurance for your workers to have the best equipment available to them. It means that you can go home each night and rest easy knowing that if something should happen, you have the best safety equipment in place. No matter if your site is small or large, residential, commercial or leisure site, consider Site Nets safety netting for your workers. Call us to day to find out how we can provide your site with the best in New Zealand safety netting! Christchurch has certainly been a phoenix since 2011 when the massive earthquake hit. From amongst the despair and destruction the city that was promised to be rebuilt has risen from the ashes and continues to do so. Bigger and better, more dynamic and with innovation found at every street corner, Christchurch is most definitely a city of the future. One of the main carparks in the city, the Lichfield Street Carpark, was deemed unworthy of repair in 2013. It was damaged so badly that it was deemed uneconomic to repair by the Christchurch City Council. There was a lot of pressure on the Council from the retail sector to see the demolition and then rebuild happen. Obviously the retail sector was very hard hit in the earthquakes that rocked Christchurch so anything that could get the retailers back into retail space and operating again was a priority. Demolishing such a structure within the confines of an inner city precinct is never easy and health and safety issues abound at every corner. 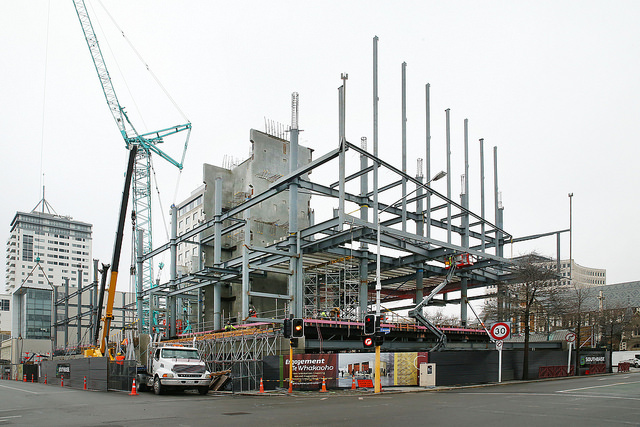 The Christchurch City Council tendered the rebuild project and a consortium led by Clearwater Construction and including DHC Consulting, DH Steel Construction and MAP Architects won the contract. As part of their process, SiteNets NZ was called upon for our expertise in site safety nets and an agreement was met to work on this project together. To date, the Lichfield Street Carpark rebuild is one of the biggest sites SiteNets has worked on. The Lichfield Street Carpark had a timeline to completion of 12 months. During this timeline 7 floors would need to be built out of structural steel and concrete. At the finale, there would be 804 parking spaces and over 950m2 of retail space. In all, almost 3 rugby fields worth of steel and concrete would be engineered, poured and installed to achieve this goal. So, why was SiteNets Ltd chosen as the operator of choice for safety netting on this commercial construction site? We have over 17,000m2 of commercial netting available for our commercial projects. As this site progressed up higher into the skyline it was imperative that scaffold safety nets were used around the perimeter of the scaffolding and temporary fencing to prevent any construction materials or other objects falling from the scaffolds. If you check out the video you can see our nets installed on the west side of the carpark as it is in construction. Our nets kept the many workers on this site safe hour after hour, day after day. 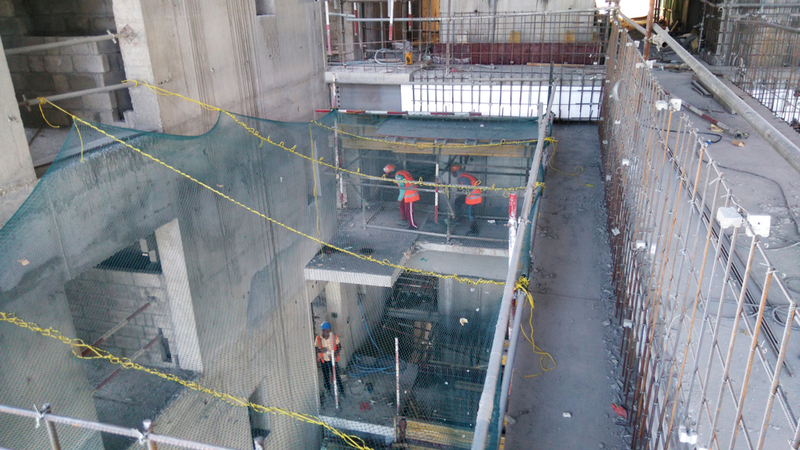 Our site nets protected adjacent buildings from falling debris and having our nets across the building between the levels provided added safety for the workers on the site should they have fallen. 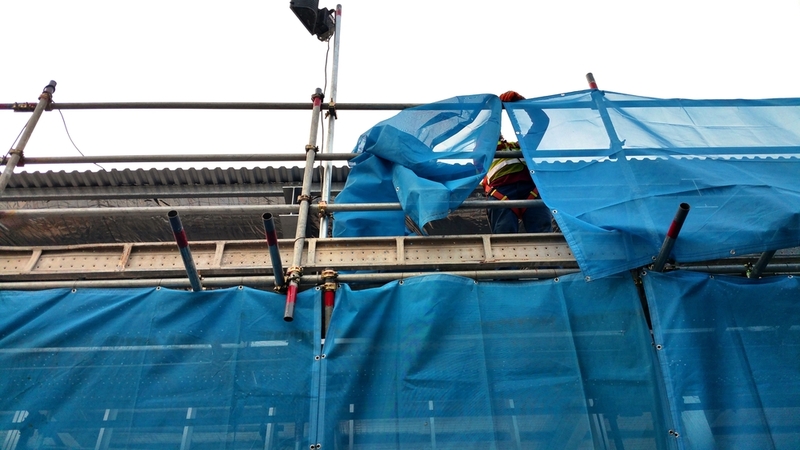 Having a safety net system from Site Nets Ltd provides the perfect safety barrier for everyone working on the top or lower levels of the scaffolds including the general public. For such a prominent building site, SiteNets Ltd was chosen as the provider of safety netting because of the quality of our netting available. 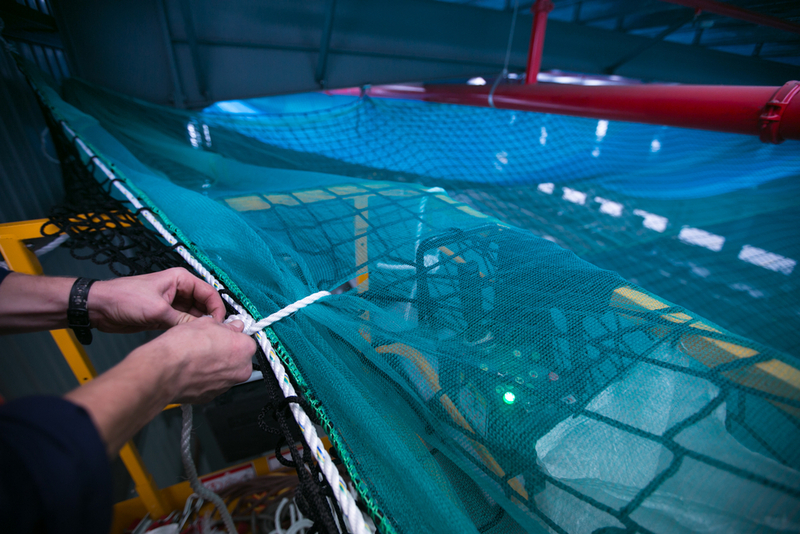 Our nets have always been subject to more stringent tests to ensure maximum safety at all times. We also have a solid reputation throughout Christchurch and Canterbury as the premium provider of safety nets for the building industry. At the completion of the Lichfield Street Carpark project, SiteNets were proud to be the providers of the safety netting. If you are requiring safety netting for your commercial project, call us! We will have the solution for you.